→You Don’t Have To Be Great To Start! "You don't have to be great to start ... but you have to start to be great!" True words and very wise. So many people I speak with are simply stuck. They are paralyzed by not knowing what to do, information overload, and fear. Fear their work is not "good enough". Fear they will spend time and money and no one will buy. Fear of what their friends and loved ones will say. I understand the fear because I feel it too. But we must all say "no" to the fear and "yes" to the opportunities presented to us. Many years ago I became a member of the Directory of Ezines. A little less than 18 months later I bought the entire company. ... When I purchased the Directory of Ezines the sales letter was not great. Low conversions. Low list building. You'll see it in this video. But I used it. And I improved it. And today it converts like crazy, looks great, and is something I'm proud to show. No matter what field you are in, do your worst work TODAY and then begin the fun and profitable process of improving what you have done. You will become a leader. Get started today and success is certain to come your way. Hey, everybody. This is Charlie Page, and I want to take you on a little tour of one of my sites today to make a very important point. It's time to do your worst. Now let me explain. Here's what I mean. The first sales letter you write, it's going to be the worst one you ever write. The first product you create, worst one you ever create. The first video you ever make, it's going to be uh. And on and on on. But so many people get stuck in not starting because they're concerned it's going to be bad. Here's the thing. 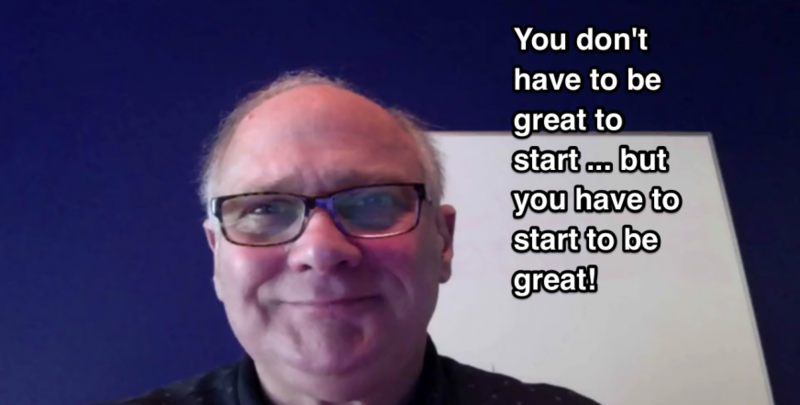 I'm going to show you today how a thing can get started and then improved. I'm going to use the Directory of Ezines as an example. If you know me, you know I own the Directory of Ezines after having become a member. I bought the company less than 18 months later. I scraped up the 39.95 to become a member of the Directory of Ezines, and I worked it and I worked it and I worked it, and then less than 18 months later, I bought the entire company. And the reason I did that is I was willing to try, to start, to work, to improve, and I was willing to stink. I have to be honest. In the beginning, my stuff was not that great. Now we've sold millions and millions of dollars from the DOE and I want to show you what these websites look like. I'm going to bring myself offscreen now and show you a tour of the DOE back in time. Okay, here we go. This is the DOE today. Looks pretty good, right? It's got a nice pretty thing. We've got a logo, and this is a very clean looking sales letter. Let's go back in time three years and see what it looked like then. Here we go. This is three years ago. This is in January of 2015. This is what the page looked like then. It was a squeeze page. My goal here was to build a list to follow up with email, still what I do today, but that's all I did then, because that was our main methodology. This is a nice looking page. I was using lead pages back then. Let's go back in time three years more and see what we've got. Okay, now we're getting to the not so pretty part. Look here how the banner doesn't even match the size of the page. And this is a squeeze page, too, but it's just not a really good one. This is back in 2012. Now let's go back in time. Remember, we've sold what, like five million dollars' worth of this over the years. Now let's go back in time to 2008. This is also not pretty. Red, white and blue, I'm good for that, but this is just one of those sites that's just a whole lot of words. There's just not much to break the eye flow. It's hard for me to believe that people read this much copy, but they did, and thank God they did, because we made sales. Okay, you want to go back a little further? How about 2005. Now we're getting into the stuff it's hard for me to show you. Okay, I made this myself on my desktop Windows computer way back in the day using a program called ... what was it called ... Excite Pro I think it was called. The words are good, but boy, look how ugly it is. It's just straight down the thing. No eye breakup. We're doing some of the right things, but here's the thing. We were willing to start and then improve, and that's the name of the game. Okay, I'm going to show you one more, but you got to promise not to look. I'm going to show you one more way back in 2002. Look at this. This thing is left justified. It's not even on the center of the page. We had an old logo for Lifestyles Publishing and then the Directory of Ezines, and then the sales letter here. Look how many distractions there are. They could get a subscription to the newsletter. They could earn as an affiliate. There was all kind of ... we were happy to stand with America. This was right after 2001. I'm still happy to stand with America, but we had that over there. We have all kind of stuff going on here, and it's just really hard to read. Look how little bitty that page is. Let me go back to today's page. Look at this text, look at this text. Do you see that? But here's the thing. This little old stinky site here, this poorly designed, ugly, stripey site, it made sales because it was out there. Here's what I want to say to you today. Do you want to do Facebook marketing? Great. Do you want to do Instagram marketing? Do you want to do email marketing? Do you want to write a sales letter, create a membership site, do anything online that will bring you a return on your investment? Then start today and do it bad. Do it bad and realize today will be the worst one you ever do. But here's the thing. It won't take you 10 or 12 years like it did me, because thank God, there's so much more information now than there was before. We didn't have tools like Clickfunnels or any kind of Script Service where we could write sales letters or anything like that back then. This was coded. This website right here was coded by hand in HTML in a text editor. And I had to learn how to do that at 45 years old, having never ... I didn't even know what HTML stood for at 45 years old, and I had to write this rascal out of my head through my fingers into a text editor. That was not easy, but I did it. And that's the point. Whatever you're wanting to do online, establish a social presence, build a mailing list, write a sales letter, create a product, get influence, it doesn't matter what it is. Start today. And down below this video there are going to be comments you can leave. Leave me a comment and let me know what you're going to do today that might not be great, it might not be your best work, but you're going to start. You're going to do it. I want to take a look. All right, this is Charlie Page. Thank you. I'm going to go back to the pretty one. There it is. That's my site now. Looks a lot better, doesn't it? Okay, but remember all of this started with this ugly rascal here. Go out and do your worst, and then once you've done that, improve on it. Make it better. Learn from it. Follow up and follow your statistics and take a look at how many people are looking and how can you make it better? Get ideas from people who've been around a long time. But here's the thing, to improve something, you have to start. My message today, do your worst and get started. Thanks, and have a great day. I’m going to my Autoresponder to setup a list to make it so I can broadcast emails to the list. So you might not hear from me for awhile. Good move. Even better move, set up your list in your autoresponder and add some messages to it so everyone who opts in hears from you without you having to do a broadcast. This is just SO GOOD Charlie… and yes, I remember all those versions of DOE from way back then when I was also a newbie… and DOE was one of the first and biggest investments I made. I actually can’t believe the timing of your message, as I’m literally at this moment brainstorming a new product/service that I want to create to help raw newbies take their first steps, and this has been a clincher to fire me up. We have to keep paying it forward, don’t we? Amen to paying it forward! I look forward to hearing about your new product and stand ready to help if you need me. I have two clients who launched products in the last 60 days and more on the verge of launching. People are making their dreams come true! Great video! I created a course recently after watching one of your mini course videos. took me two weeks to complete it. Now i need to get it out there. Congratulations! Contact me via support if you want help doing that. Thanks for your latest post, and the encouragement therein, I want to build a list of subscribers and therefore am looking into creating a squeeze page with free gift to offer. This will be my first endeavour and created on a shoestring budget so wish me luck. What product are you promoting? I might be able to offer some suggestions. Good for you! Let me know if I can be of help in any way.